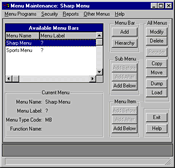 The Sharp Menu System™ is a sophisticated menu security system that allows developers, administrators, and end-users to create their own menus and provide consistent, flexible security to a Progress-based application. 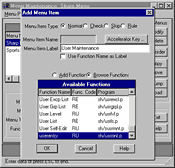 If you’re a developer, writing and maintaining your own menu system is a tedious task, especially when a deadline to produce a robust business application for your client is looming. 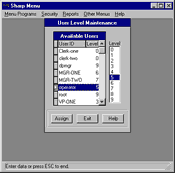 The Sharp Menu System™ is a pre-built database-driven solution that frees up your time to focus on application issues, not menu and security administration. 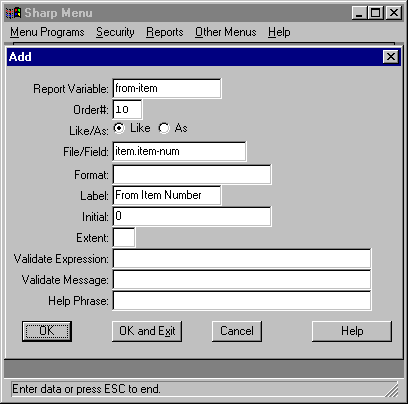 Since it applies all the latest language enhancements from the Progress 4GL, whether your application development uses Progress SmartObjects™ from within the Application Component Environment or you have developed your own customized set of objects, the Sharp Menu System™ will easily accommodate your methodology. For example, the event-driven programming model is supported using persistent procedures, allowing users to switch effortlessly from one application function to another while the Sharp Menu System™ automatically keeps these application resources in memory for as long as needed. 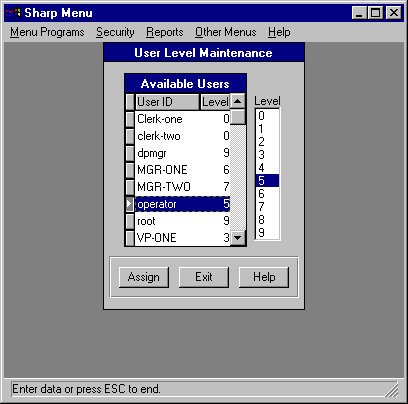 For the administrator, the Sharp Menu System provides a comprehensive security system offering powerful yet easy-to-use administrative functions. This state-of-the-art security approach is ideal for user environments that are constantly changing. Applying security to new functions or new users is quick and easy. For example, your company has hired a new employee in accounts receivable. The Sharp Security System lets you assign to the new user all the functions for the accounts receivable system or copy the security from an existing accounts receivable user, depending on your requirements. Another example would be the addition of a new financial report to the Sharp Menu System that only vice-presidents were allowed to access. With a few keystrokes or mouse clicks, you can set the level of security required to let the vice-president in and keep unauthorized eyes out. 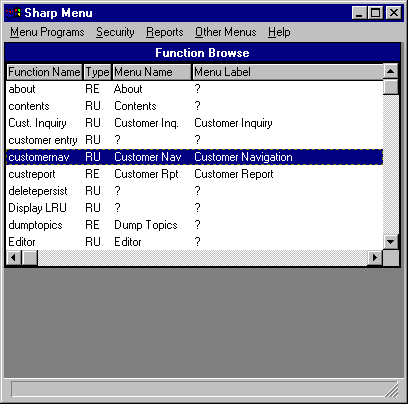 End users will also enjoy using the Sharp Menu System. 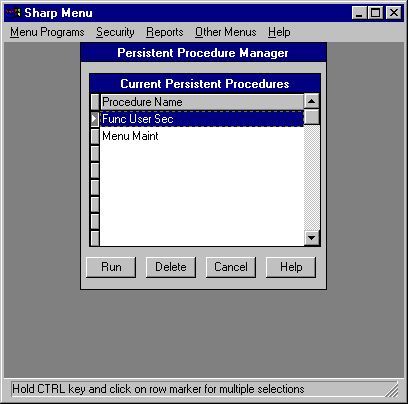 The Persistent Procedure Memory Manager lets them easily switch from one function in memory to another, much like switching between multiple open applications in Windows. Should the amount of free memory available become low, users can simply remove the functions they are currently not using from memory. 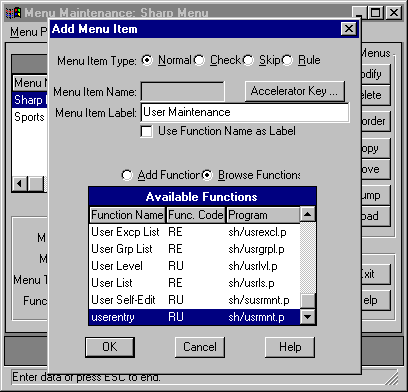 In addition, users enjoy added conveniences, for example, launching functions that aren’t on the current menu by using the Function Browse feature. 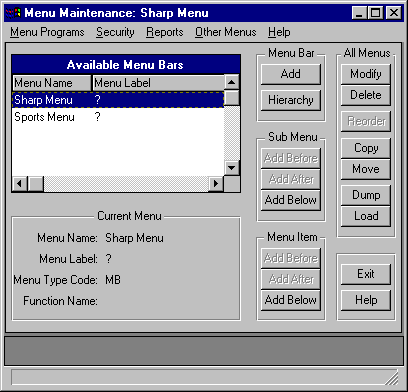 In addition to the database-driven menu features, the Sharp Menu System™ has a sophisticated security system with the capability to handle at least one hundred users and hundreds of functions using three levels of security. Level security is the simplest to implement. 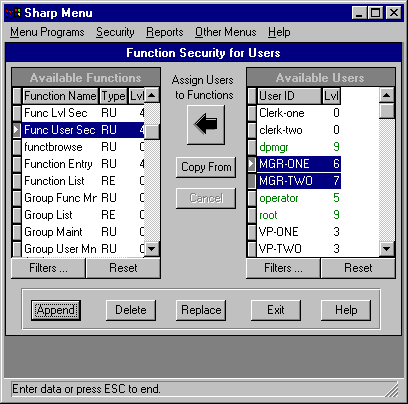 Each function and user is assigned a level from 0 to 9, from least to most secure. 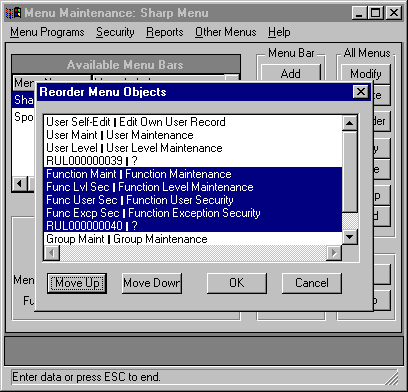 A user may access functions of the same level or lower. User list security allows an administrator to list specifically which functions a user may execute. 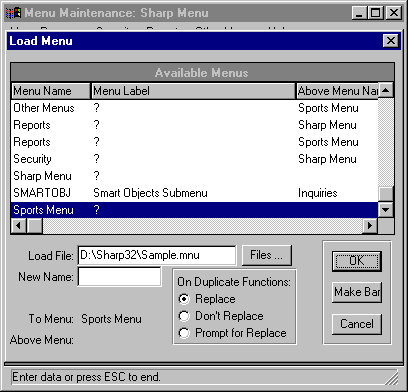 The Sharp Menu System™ provides powerful grouping tools, making it easy to add users to existing function lists and vice versa. 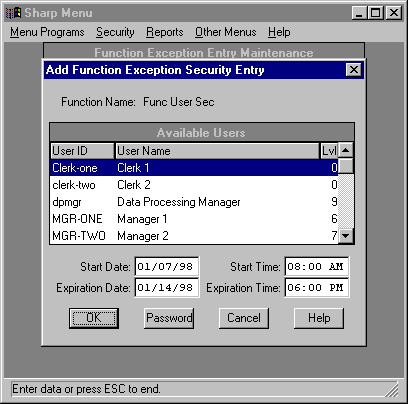 Exception security allows administrators to grant temporary or password permission to users for designated functions. For each exception, administrators may specify a starting and ending date and time, supply a password, or both. This type of security is ideal for situations when employees are out of contact with the office for an extended period (on vacation, at a conference, etc.). E-mail or call Paul Guggenheim & Associates at (847) 926-9800 for pricing and availability.